Greetings, francophiles! Here are some site specifications and user tips which we hope will make your visit to DiscoverFrance.net more enjoyable. If, after reading this Help file, you still have difficulty viewing any pages or using features on this site, we would appreciate immensely if you could report the issue to our webmaster. Thank you! This site has been optimized for viewing at monitor resolutions between 800x600 and 1600x1200 pixels (depending on monitor size), in all standard browsers for desktop computers on both the Windows and Macintosh platforms. These include AOL Explorer, Camino, Firefox, iCab, Microsoft Internet Explorer, Opera, and the Macintosh Safari browser. As of this writing, the site has not been tested for compatibility with WebTV browsers, handheld computers such as the Palm Pilot, or portable devices such as cellphones. If you are using any of the above supported browsers and experience difficulty viewing a page or using features on this site, please report the issue to our webmaster. In your report, please be sure to indicate the URL (web address) of the page where you found a problem; also specify your browser version and operating system. We employ Cascading Style Sheets (CSS) extensively on this site. For the layman, these are definitions which specify the font family, type size, text decoration, borders, positioning, and other characteristics which you see in the headlines and body text on every page. Older browsers (generally Internet Explorer, Netscape, or Opera before version 5.0) may have supported CSS in a limited fashion, or not at all. We heartily recommend that you upgrade your browser to a modern version, in order to enjoy the formatting and lay-out of this site to its maximum potential. Generally, the choices of font families used here include the following: Verdana, Arial, Helvetica, and Swiss  these are referred to as "sans-serif" (without serifs) type styles. In most instances, one or more of these fonts would have been installed on your system when you installed your web browser. If your system contains none of those fonts, then your browser display will either default to the sans-serif font which you do own, or a serif font (such as Times). The type sizes most commonly used here represent a compromise between the default settings of different platforms, providing an emphasis on legibility and usability for the widest possible audience. For example, the Macintosh platform  which is optimized for graphic design  tends to display type at smaller sizes than Windows systems. Many webmasters who test their sites only on Windows machines will use type that is illegibly small when viewed on a Mac. We do not believe in restricting our usability to platform-centric standards, or in denying access to those with visual disabilities (such as presbyopia, a common condition of aging); thus, our text will be legible on a wide range of computing platforms, browsers, and monitor resolutions. Still, if you find that the size of type on our site does not meet your needs, most browsers will allow you to adjust it  either in the Preferences/Properties settings or on the toolbar itself. Please refer to your particular browser's Help file for instructions. Since the early days of the Internet, both browser technology and computer hardware have evolved significantly. As the price of hardware has declined, inversely proportionate to technology improvements, most modern desktop computers now include graphics cards which can display thousands  or even millions  of colors. In a throwback to the "bad old days", when many corporate desktop computers were still limited to displaying only 256 colors, we have taken great pains to design graphics using the 216-color "web-safe" palette  a set of colors which is cross-platform and cross-browser compatible. Although this has become increasingly unnecessary, it is done out of consideration to those still using "dinosaur" machines. In photo images, however, a monitor resolution of 256 colors may still display "dithering"  a grainy quality where color variations show up as a pattern of ugly dots. If your computer's graphics card is capable of displaying at least thousands of colors, we recommend you switch your monitor display to this higher setting. The DiscoverFrance.net site contains many hundreds of pages on topics related to France and French culture. To provide site-wide navigation in the form of text links on every page would take up way too much room! Instead, most pages are equipped with space-saving drop-down (or pull-down) menus in the top header. The left menu offers four master categories: France, Paris, Provinces, and Colonies. When you make a selection in this left menu, the right one changes to display that category's list of topics. Simply scroll or drop down the right menu to the topic of your choice; you may need to click on it until it is highlighted. In most cases, releasing your mouse button will transport your browser to the new page; if it does not, click on the "Go" button to do so. Perhaps you have a topic in mind, but you're not sure which page title in the navigation menus might be the best place to look? Sometimes a Site Map entry or navigation topic might not contain the keyword in question. In that case, you can try our search engine to find related information on the site. On most pages, you will see a search box either in the top header or by scrolling down the left blue section (look for a magnifying glass). We also offer an Advanced Search page, where you can focus your query by various criteria  such as file type (image or text), creation date, etc. On that page, you will also find several other English and French search engines which can scour the entire Internet for your topic. Some pages offer links which will open a new browser window containing a multimedia player, offering you the option to listen to background music while you surf the site. These music files, which are in MIDI (Musical Instrument Digital Interface) format, require that your browser have a MIDI-compatible player or plug-in installed. Common players include Apple's Quicktime and Windows Media Player. It is likely that at least one of these was installed by default when you installed your web browser. There are also a plethora of other multimedia players available for both Windows and Macintosh platforms, which you can download from the Internet and install yourself; just search for keywords like "free MIDI browser plugin". Please refer to the instructions for the player you download, and/or your particular browser's Help file, to configure it correctly. Depending on which media player you have installed, you should be able to pause, stop, resume play, and vary the music volume using the controller's function buttons or slider control. Some players will also allow you to vary the pitch and tempo of the music. Throughout this site, you may find links to documents which are formatted in Adobe's Portable Document Format. In order to view these documents, you will need to have Adobe's Acrobat Reader installed on your computer. In most cases, this installation would have already been done for you, when you installed your web browser. If it was not, or you wish to update your Acrobat Reader to the latest version, visit Adobe's web site  where you can download it for free. There may be instances where you navigated within this site, or you came here from another site, and encountered an error message because the desired document could not be found (known as a "404 Error"). For a detailed explanation of "File Not Found" and other errors, please click here. If you're stuck viewing this site inside a frame from another site, click here to open up the DiscoverFrance.net home page in the ENTIRE window. Sometimes other webmasters who link to our site forget to format their links properly, so this may happen to you; please report the name and URL (Internet address) of any such site, so we may alert them of the problem. Thank you! Should you encounter any other issues not covered here, we would be most grateful if you could report your experience to the webmaster. We hope you have a pleasant journey at DiscoverFrance.net! All of the contents at DiscoverFrance.net  including, but not limited to, the site's lay-out design, logos, graphic images, link descriptions, and other text  are subject to copyright laws in the United States and other countries. Attributions to copyright owners are generally specified on each page. When and if you cannot locate the copyright notice for a particular item, assume that the copyright holder is DiscoverFrance.net, its parent and/or affiliate. There can be substantial criminal penalties and civil liability for misuse of copyrighted material. If you wish to use portions of this site for homework assignments, a personal web site, commercial use, or any other application, you should write to the webmaster requesting permission and explaining your purpose in detail. If permission is granted in writing, you must always include a copyright notice, including the source of the material and the URL or hyperlink to DiscoverFrance.net, in your work. For a more detailed description of our copyright policies, warranties & disclaimers, and user agreement, please click here. Your continued use of this site means you have read and agreed to all the terms stipulated on that page. Images: (1.) 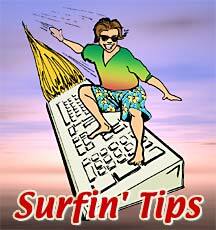 Surfin' Tips - Surfer dude on keyboard, and (2.) Sleuth searching for clues, both © DiscoverFrance.net, edited from artwork licensed by Nova Development Corp. (Art Explosion 750,000 Images).